Written by Janet Choi on November 9, 2017 . Most users go off the rails from our best-laid plans. And if your lifecycle communication falls off a cliff into silence after signup or fails to strike a chord, the result is indefinite derailment, abandonment and churn. So we try to get users to do what we want them to do, telling them to “do this” and “click that” and “let us know if you need help with the thing you don’t know or care about yet” — and that’s the problem. Our message is wholly based on what we want and assume. This is the crude railroading approach, as we explain in our post on lifecycle campaign lessons from Dungeons & Dragons. “Railroading”, in D&D, refers to the frowned-upon practice of trying to force players into a pre-written plot, when the fun of the game is in collectively creating the story. Many ineffective lifecycle emails take this approach, coming off as annoying and tonedeaf, because they’re not taking real account of the recipient’s needs. The best case is when you can guide users after they stray because you’ve built an “invisible railroad” — shrewdly subtle tracks created by your lifecycle messages — designed with the explicit expectation that people will and do wander. By understanding where customers are in their journey and their needs, you’ll know what carrots to employ to get them to follow through. From a cart or page browse abandonment follow-up or prompting new users to set up a reminder for a new habit – the art and craft is in getting all the elements of message, timing, and person right to guide user actions, but without futile dictation or tiresome prescription. This requires deliberately planning for contingencies and preparing for cases of derailment. The reality is that customers are going to do their own thing. For example, they might neglect to download that desktop app, their visits might taper off before experiencing an “aha moment“, or worse, never come back after a cursory look around. And while many of us think in terms of positive actions we’d like our users to complete, we don’t think quite as hard about how to proactively head off inertia, inactivity, and lack of progression. Let’s look at an example of a company and the invisible railroad tracks they’ve designed to account for potential inactivity and impedement. Meal delivery services are all the rage right now, so you’ve probably heard about Blue Apron. Their goal is to deliver delicious selections every week. Here’s a look at how they shepherd people towards key destination points in the customer journey. 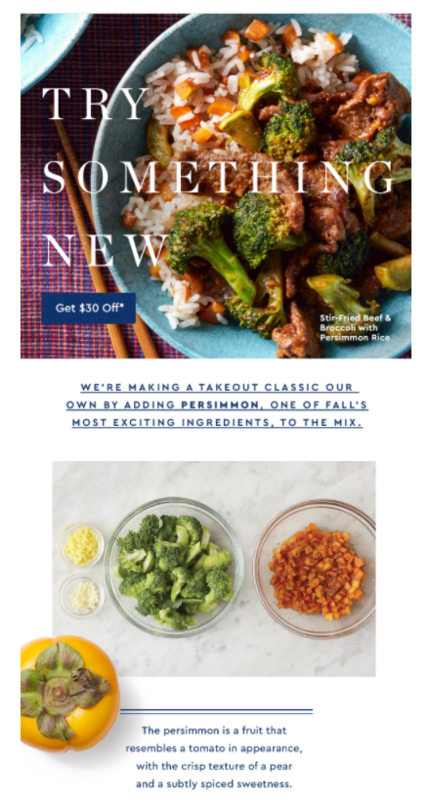 At this point, Blue Apron knows that your interest was high enough to start actually signing up. So in this abandoned cart email, they address doubts and concerns that might’ve stopped you in your tracks. The “one more step” reminder helps in case you got sidetracked. There’s a $30 discount off your first box to lower the risk of spending money on an unknown experience as well as reassurances that the recipes are easy to follow and the shipping, free. Plus there’s a quick overview of how the service works to show you how easy it all is. 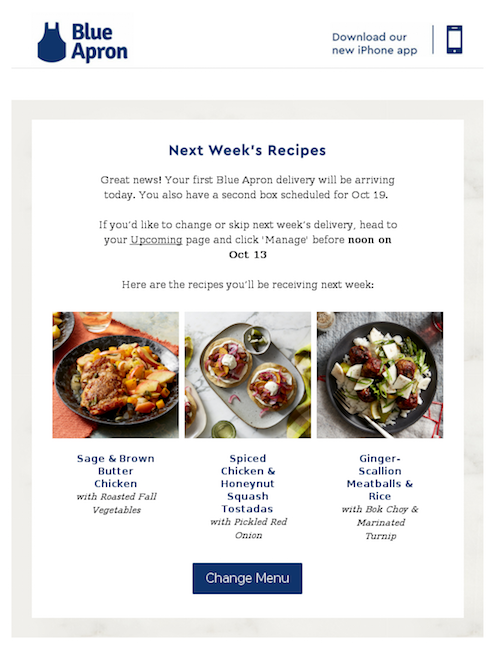 If you abandon your cart and don’t finish checking out or subscribe to Blue Apron’s newsletter, you’ll start receiving offers to convince you to give them a try. 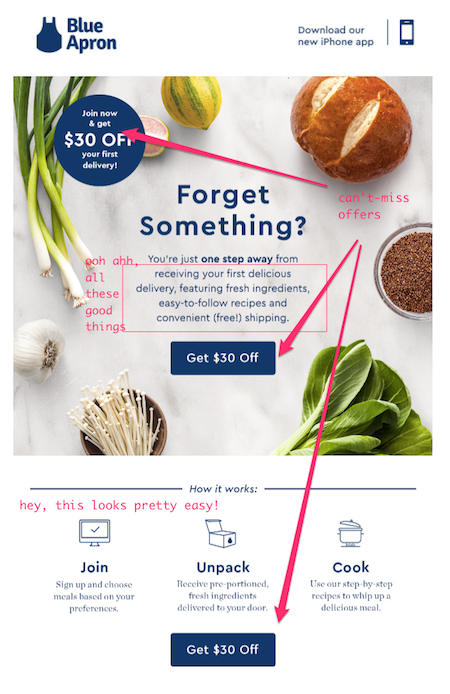 What’s interesting is that the calls to action in these emails all lead you to a signup page for the service itself (rather than blog posts or recipes), so their conversion goal is crystal clear: they want you to buy that first box. The assertive conversion goal here is more straightforward railroading than invisible railroading – but what the emails do well here is mix and match persuasive tactics to go deeper than a repetitive discount offer. 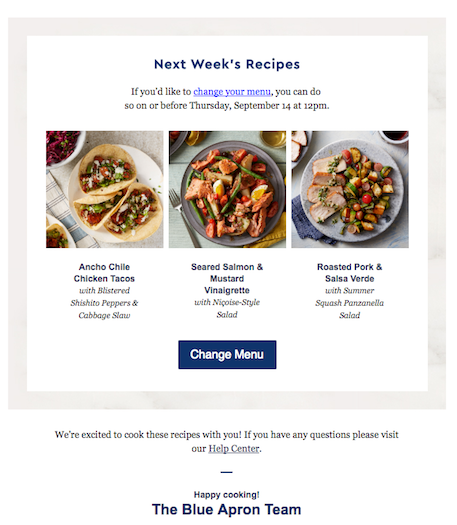 These newsletters show off appetizing food photography, evoke seasonal cravings and entice with popular dishes, and pique interest with actual weekly menus for Blue Apron customers. They also address real-life situations and painpoints that lead people to consider Blue Apron — like wanting to eat healthier, spend less on prepared food, or consume sustainably-sourced ingredients. 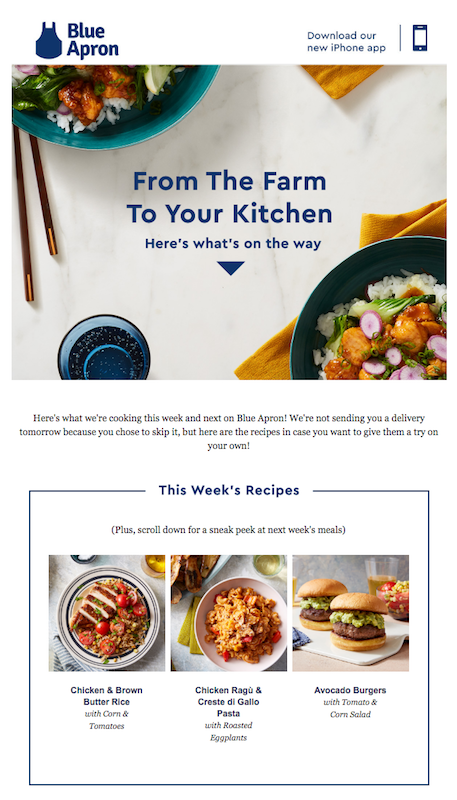 For instance, the newsletter below highlights how quick and easy their recipes are, framing Blue Apron as a solution for someone short on time to shop and prepare quick, delicious meals. These all-time customer favorites only take 30 minutes to make. This newsletter speaks to anyone interested in mixing up their meal routine to try cooking new dishes and learn about new ingredients. Here, they take a popular delivery/take-out favorite that you can make at home while using a lesser-known, seasonal ingredient: the persimmon. Then if you do skip a week, they send you a notification confirming the skip while still showing you the meals you would have gotten. 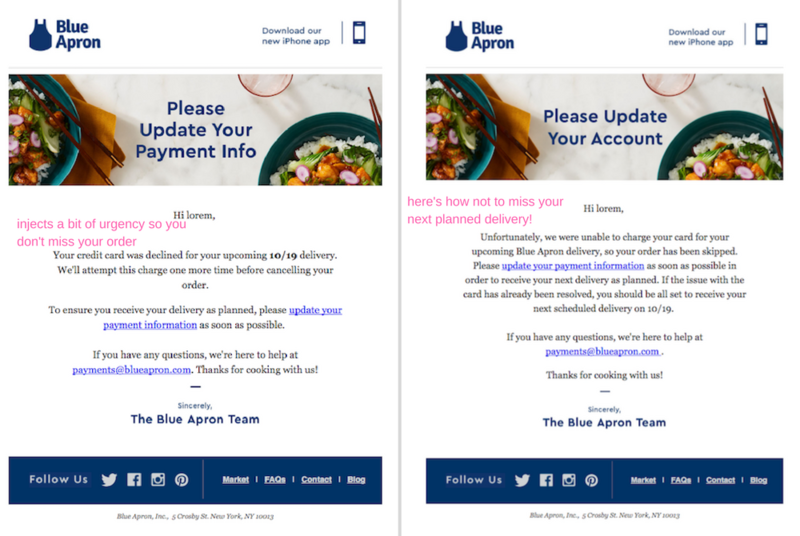 Instead of sending a simple note confirming a customer’s choice to skip a delivery, Blue Apron is laying down some nice tracks here to keep top-of-mind while still providing some value and buttons for you to push to customize your experience. The customer gets what they want while staying in the loop of what comes next. In any recurring revenue business, there’s a chance that your customers’ payments will fail because their card expired, was cancelled, or was declined for some reason. A chunk of your churn may be “involuntary”, with people leaving, not because they stopped valuing you but because of inertia – not getting notified in enough time to care. When there’s a payment-processing issue, Blue Apron sends a notification one time before cancelling an order and then after an order has been skipped. This is a deliberate attempt to prevent permanent derailment – that the customer didn’t even voluntarily initiate. 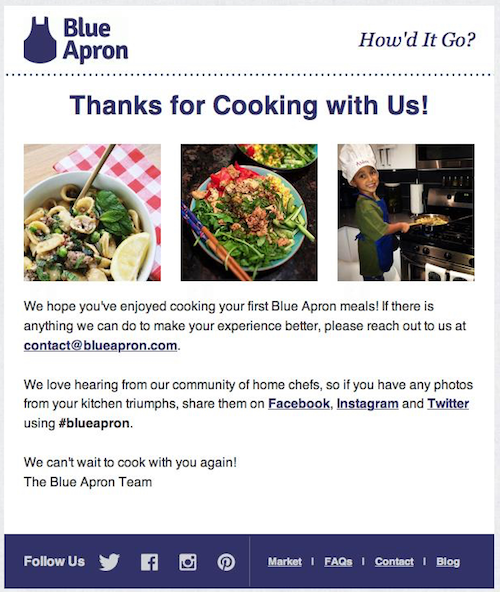 After the first delivery, Blue Apron sends a “Thanks for cooking with us” email that solicits feedback and urges you to upload pictures of your meals to social media. Right after your first Blue Apron meals, you haven’t derailed …. just yet. This particular message lays down tracks to prevent future derailment. All the communication efforts before this point aimed to get people to try out the service. Now, right after this first experience is an opportune time to field feedback to cement a positive relationship with new customers — ensuring that any dissatisfaction doesn’t stem from confusion or misunderstanding — and foster a positive emotional connection (and customer-generated promotional marketing) by encouraging them to show off their culinary handiwork. Yes, most people will head off the rails of your lifecycle journey plans. But you can deliberatelydesign for key parts of their adventures to make sure any natural derailment isn’t permanent. It helps to understand behavioral psychology to maximize customer engagement and be deliberate with contingency plans. It’s a lot of work to think through multiple scenarios that people can choose, but it pays off. Instead of feeling like they’re being pushed to buy something, they feel like you’re guiding them to something that will make their experience better. Your invisible track helps users make progress towards their goals in your product, guiding them with more nuance, responsiveness, and an acknowledgement for how humans really make decisions. Learn more about how the [invisible railroad concept can serve as a useful framework for your lifecycle campaigns]!